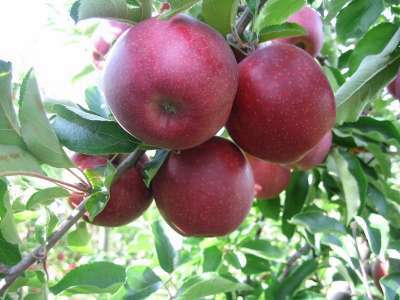 A Jonagold clone with impressive large attractive fruits which are almost entirely covered with a uniform red. This variety can be very heavy yielding, to maintain the potential fruit size some thinning may be necessary. Flesh crisp, juicy, green-white with a good flavour akin to Jonagold. Harvest early October and in use until Christmas. A lovely addition for all Jonagold fanciers.